You should never argue with the ballot box. 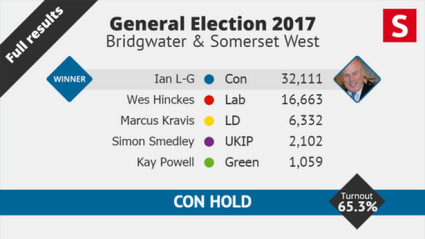 Bridgwater and West Somerset sent me back to Westminster with a substantially increased majority. Many thanks are due to those who gave support with such enthusiasm. But there are also important messages that have emerged from this unexpected election. I believe the national Conservative campaign could have been handled more sensitively. Brexit played a very large part in deciding how votes were cast, but basic social issues right here at home also mattered – and, perhaps, we failed to say so with sufficient strength. As a matter of fact, we care deeply about jobs and education and health and pensions. During the past sixteen years my postbag has been dominated by real social problems. So, I listened intently to people during the campaign and did my best to put them right when they queried new policies that had not been adequately explained – like social care for the elderly and means testing for the Winter Fuel Allowance. In the aftermath of the results and the turmoil of establishing a stable government we now need to refocus our priorities to ensure that everyone recognises what we are saying and how the vulnerable can still be properly protected. We need to prove that we are worthy of representing everyone, irrespective of politics – in Bridgwater & West Somerset that means young people who voted for the very first time last week, senior citizens, those in work and out of work. As your MP it will be my duty to serve this constituency as a whole, stand up for common sense, fight for fair play and always try to do what is right.